Following the Commencement-week meetings of the Harvard Corporation and the Board of Overseers—the University’s governing bodies—three new appointments to the Corporation were announced today. These appointments, signaled in a conversation with Senior Fellow Robert D. Reischauer and President Drew Faust in early April, are a tangible step in implementing the changes in the "composition, structure, and practices" of Harvard governance announced late last year—including the expansion of the Corporation from seven members (the president and treasurer plus five Fellows) to 13 (the president, treasurer, and 11 others). That expansion was explained as a fundamental step intended to provide the Corporation with more diverse and deeper expertise; to increase its capacity to exercise its fiduciary responsibilities for matters of finance and governance, in part through the creation of standing, substantive committees; and to augment its capacity generally. • Joseph J. O’Donnell '67, M.B.A. '71, a Boston business executive, past Overseer, current member of the Allston Work Team, (the group charged with formulating new plans for campus development in Allston, through which O'Donnell has worked closely with a number of current deans), and a leading force in Harvard and other philanthropic activities (see a Harvard Business School video here). A baseball fan and 1967 captain of the Crimson team, O'Donnell was a bidder when the Boston Red Sox were sold in 2001—an opportunity that combined his interest in the sport and in the stadium food concessions, his principal business; reflecting his endowment gift for the post in 1995, the position of Harvard's baseball coach bears his name. The baseball venue was named O'Donnell Field in 1997. Daughter Kate O'Donnell graduated from Harvard in the class of 2009; her sister, Casey O'Donnell, is in the College class of 2011. Read the University announcement here. Last December we wrote to announce a set of changes regarding the composition, structure, and practices of the Harvard Corporation, growing out of a governance review conducted over the preceding year. One of those changes was the decision to enlarge the Corporation from seven to 13 members, in order to expand its collective capacity. We aimed to achieve this enlargement over two to three years. We are pleased to write now with news of three new members of the Corporation, formally known as Fellows of Harvard College, who will take up their roles on July 1, following actions today by the Corporation and the Board of Overseers. 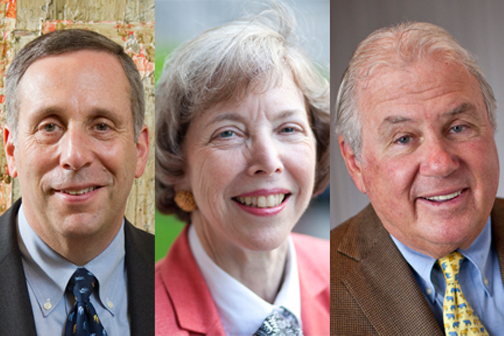 The newly elected Fellows are Lawrence S. Bacow, Susan L. Graham, and Joseph J. O’Donnell, three accomplished individuals with long-standing knowledge of Harvard and higher education, and with perspectives and expertise we are confident will serve the Corporation and all of Harvard well. Lawrence Bacow will step down this summer as president of Tufts University, which he has led with distinction since 2001. He is widely viewed as one of the most thoughtful and effective university leaders in the nation, and his service at Tufts has featured efforts to foster civic engagement, to enhance access to excellent higher education, and to increase cross-school collaboration. President Bacow has three degrees from Harvard—J.D., M.P.P., and Ph.D. Before being named president of Tufts, he was the chancellor of the Massachusetts Institute of Technology, where he had responsibility for graduate and undergraduate education, student life, strategic planning, international partnerships, and relations with industry, among other things. He is a scholar and educator of broad-ranging interests, with a focus on environmental studies, and is a past director and co-founder of MIT’s Center for Real Estate. He is also a highly experienced trustee, and someone deeply familiar with the challenges and opportunities facing universities locally, nationally, and internationally. Susan Graham is a distinguished computer scientist who has long served on the faculty of the University of California, Berkeley. She combines deep scientific knowledge with many years of close engagement with Harvard, ever since her undergraduate days at Radcliffe College. She served as an elected member of Harvard’s Board of Overseers from 2001 to 2007, and in the final year of her term was a much-admired president of the board and a member of the University’s presidential search committee. She played a key role in the transition of Harvard’s Engineering and Applied Sciences enterprise from Division to School, and is the immediate past chair of the School’s visiting committee. In addition, she was the first chair of the visiting committee to the Radcliffe Institute for Advanced Study, and is a past elected director of the Harvard Alumni Association. Also engaged with the arts, she is a vice chair of the board of trustees of Cal Performances, Berkeley’s performing arts organization. Her work in computer science has been recognized with prestigious honors from both the Institute of Electrical and Electronics Engineers and the Association for Computing Machinery. Her university citizenship has been recognized with both the Berkeley Citation and the Harvard Medal. Joseph O’Donnell is one of Boston’s most highly regarded and widely influential business executives, one of the area’s most active civic and philanthropic leaders, and one of Harvard’s most engaged and respected alumni. He currently chairs Centerplate, a prominent organization in the food-service industry nationwide, and was long chairman and CEO of Boston Culinary Group. He is also the longtime owner of Allied Advertising Agency. He and his wife founded The Joey Fund, which supports cystic fibrosis research, in memory of their late son, and he has long been a leading trustee of the National Cystic Fibrosis Foundation. He has served on the boards or councils of numerous educational, biomedical, and charitable organizations, and was appointed by President George W. Bush to the President’s Advisory Committee on the Arts. Highly active in Harvard alumni affairs circles since his student days at both Harvard College and Harvard Business School, he has been an Overseer, an elected director of the HAA, a visiting committee member, a prominent figure in a wide range of development efforts, and for years a valued advisor to presidents, deans, and other Harvard leaders. Many members of the Harvard community—faculty, staff, students, alumni—have been in touch with thoughtful advice on the Corporation search, and all of us on the search committee are grateful to everyone who has taken the time to offer counsel. For now, we are extremely pleased to welcome this trio of members to the Corporation, and with them we look forward to carrying forward the broader set of Corporation changes that we announced last December. Having had the experience of reviewing several hundred nominations during the course of the search, we are powerfully reminded of the extraordinary strength, devotion, and accomplishment of the Harvard community worldwide.